The “Kiki-gaki Map” is map making software for computers that is easy to use. We developed it in order to support an approach of safety inspections within local community. The “Kiki-gaki Map” enables us to make a safety inspection map of the local community surprisingly easily and in a scientific way. 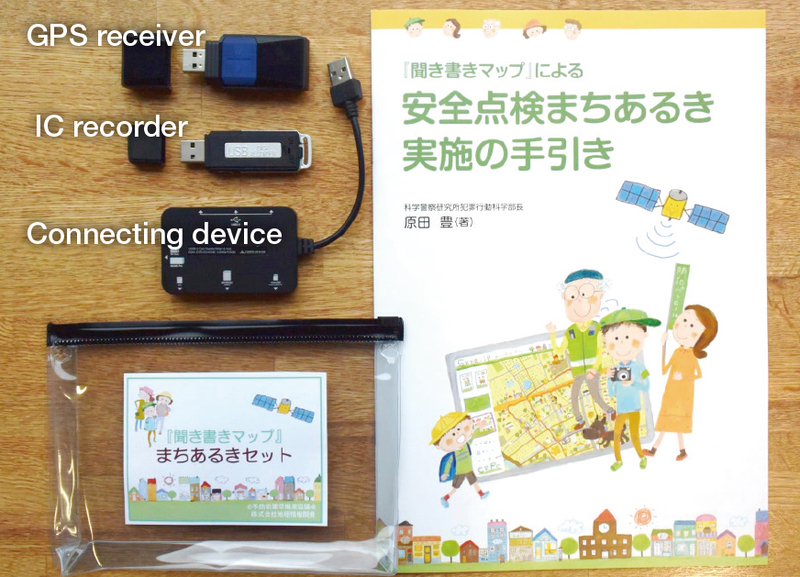 The “Kiki-gaki Map” needs to be used with “3 small tools”, which are (1) GPS receiver, (2) IC recorder and (3) digital camera. When you bring the three items to the safety checking walking, the route you walk will be recorded automatically by the GPS receiver. The photographing spots of pictures will also be automatically recognized by data of GPS. Pick a picture and the recorded sound will skip to the moment! IC recorder records things you notice while walking instead of taking notes on paper. When you return from the walking, data will be imported into the “Kiki-gaki Map”. When displaying a picture you took, the recorded sound will also automatically skip to the photographed time of the picture. This is how the main points of the recording are effectively “listened and written (Kiki-gaki)” on the note. “Kiki-gaki Map, Version 3”, soon to be completed, will be easy in operation to print out the map that shows the route of the walking and photographing spots of pictures as well as the card-type lists of notes that are written from pictures and recordings. With the maps and the lists, the safety checking map will be completed by hand through the discussion among the entire staff, this is almost the same way as the previous map making method. 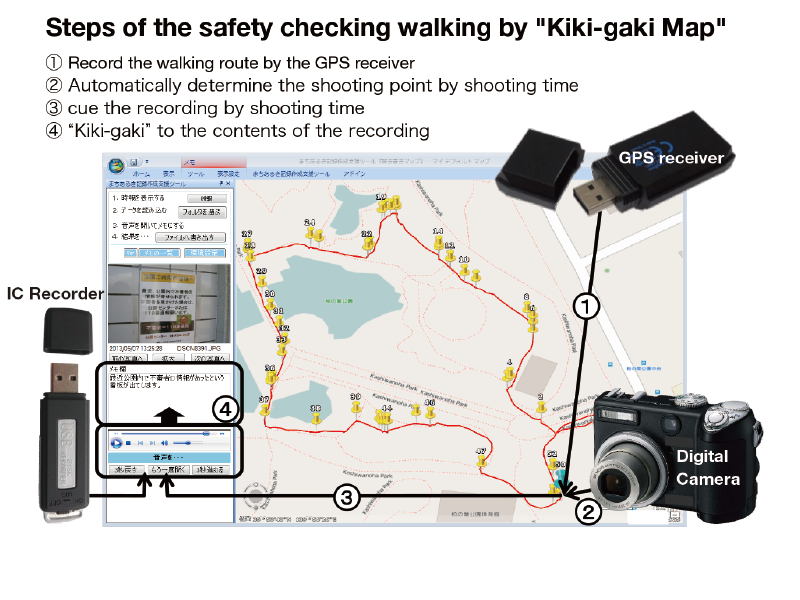 Another characteristic of the “Kiki-gaki Map” is to be able to accumulate information of the safety checking map as a scientific and objective data. At a research presentation of the “Kiki-gaki Map” it was awarded “Poster Session Award” by “GIS Association of Japan”. A “Community Walking Set”, containing all the necessary items, is in preparation. We are proceeding the preparation to release a “Community Walking Set” that contains all the items for the “Kiki-gaki Map”. This enables everyone to use the “Kiki-gaki Map” right after picking an item up from the bag. Only the electricity fee to charge “3 small tools” is the cost for maintenance. Tragic crimes targeting an innocent child, like kidnapping have never been ceased. Crime prevention becomes a big social concern. The “Kiki-gaki Map” was invented so that it can help the efforts of crime prevention for all the parties concerned. Since its first public exhibition in 2011, trial operations at various sites have been done and the results have also been reflected for improvement. Now, it is adopted for a training project of the next generation volunteer for crime prevention and also for a model work of safety learning at an elementary school. 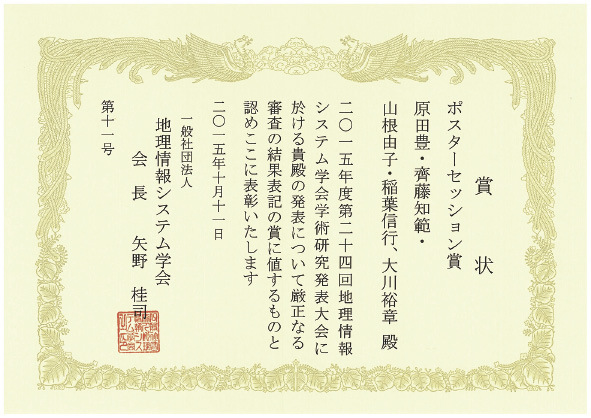 In addition, it was awarded at a learning society as a scientific and practical method for safety checking map making. The new version, that is compatible with the latest Windows 10, is almost completed and will be released in spring 2016. The “Kiki-gaki Map” can save labor in safety checking map making, which enables people to work without unreasonable force. For example, a survey was conducted at a school teacher training organized by the Office of Education from the A prefecture in the Metropolitan area. More than 70 percent of answers were “I agree” to the question of “it saves more time than the old map making method”. Also, the questions of “it is useful for the prevention of children’s accident and damage” and “it is useful for the safety inspection of school route” resulted in over 90 percent of answers of, “I agree” and “I slightly agree”. Adopted for a model project by MEXT and practiced at a class for fourth-year elementary school students. Since 2015, the safety checking map making for school routes has been carried out using the “Kiki-gaki Map” as the one of model projects of “Comprehensive Support Project for Practical Safety Education, Focusing on Disaster Prevention Education” by MEXT. At the elementary school chosen as a model school, the safety inspection activity with the “Kiki-gaki Map” was carried out in the social studies class for the fourth-year students. 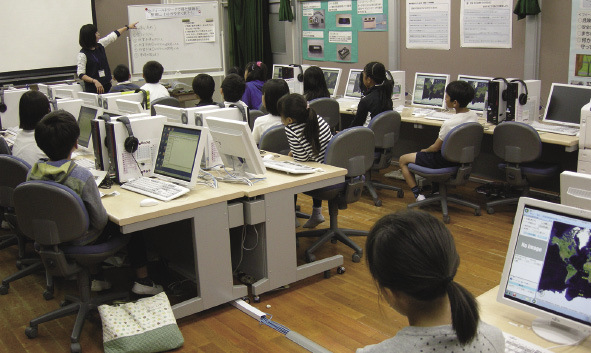 About 80 students took part in activities such as the field work using the “3 small tools”, importing data into a computer, and printing out the map to make the safety checking map. Japan National Crime Prevention Association started the safety checking map making training with the “Kiki-gaki Map” in 2015 as a part of “Project for the Training of Next-generation Volunteer Crime Prevention Leaders”. During the first year they had the first training meeting in January and the second one in December. About 70 people from 25 Prefectures participated in total. 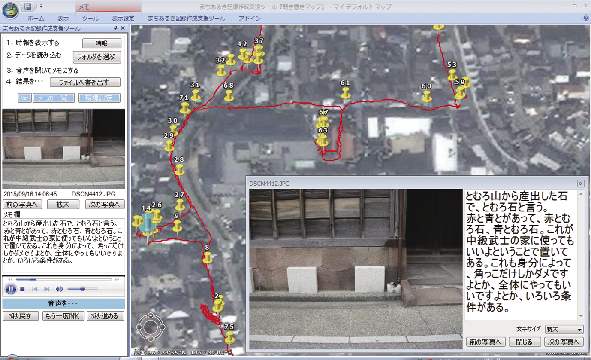 The one day training covered installing the “Kiki-gaki Map” into a laptop computer per a Prefecture, walking the town, completing the map, and announcing the result. In an attempt to use the map making in a field other than crime prevention, a partnership with Satellite Positioning Research and Application Center and Kanazawa Institute of Technology was made. We started the attempt to put the local “treasure” guide information by volunteered tour guides into data by the “Kiki-gaki Map” and then to publish it in various languages. The first walking the town for the attempt was carried out in Kanazawa City on September 2015. Thus, the “Kiki-gaki Map” has spread through various “sites” nationwide. We will do our best to bring the “Kiki-gaki Map” out to more people who need it. The presentation videos by "Kiki-gaki Map"